Several years after his last adventure, retired fortune hunter Nathan Drake is forced back into the world of thieves. With the stakes much more personal, Drake embarks on his greatest adventure in a globe-trotting journey in pursuit of a historical conspiracy behind a fabled pirate treasure. Every treasure has its cost and this adventure will test Drake's physical limits, his resolve, and ultimately what he's willing to sacrifice to save the ones he loves. 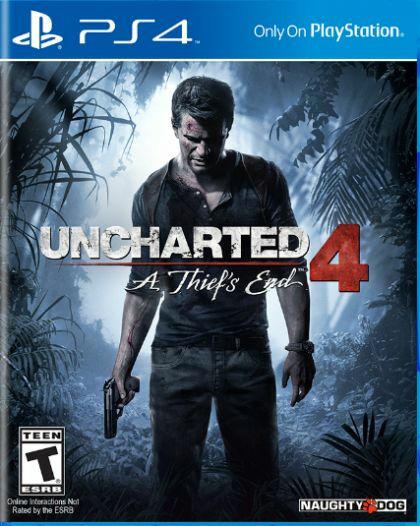 UNCHARTED 4: A Thief's End is the latest installment of the award winning UNCHARTED series from acclaimed developer Naughty Dog. Launching exclusively for the PlayStation® 4 system, A Thief's End delivers the most thrilling UNCHARTED adventure yet with new gameplay mechanics, larger, more open environments, and enhanced graphics and animations that showcase the power of the PS4 system. Set three years after UNCHARTED 3: Drake's Deception, Nathan Drake has presumably left the world of fortune hunting behind. It doesn't take long for adventure to come calling when Drake's brother, Sam, resurfaces seeking his help and offering an adventure Drake can't resist. On the hunt for Captain Henry Avery's long-lost treasure, Sam and Drake set off to find Libertalia, the pirate utopia deep in Madagascar. UNCHARTED 4: A Thief's End takes players on a journey through jungle isles, urban cities and snow-capped peaks on the search for Avery's fortune. Next-Gen Blockbuster Adventure: UNCHARTED 4 ushers in a more cinematic experience on the PS4 system with real-time cut scenes and new character animations to highlight Naughty Dog's signature storytelling. UNCHARTED Multiplayer: UNCHARTED 4 will continue to evolve the franchise's multiplayer experience on PS4.